2007 was a good year, from the iPhone to Leopard and the iPod but, it has come time to say goodbye. Everyone at theiLife.com would like to wish you a Happy New Year!! Say goodbye to 2007, prepare your resolutions and- don’t forget about Macworld! Always remember, drink and drive- responsibly! 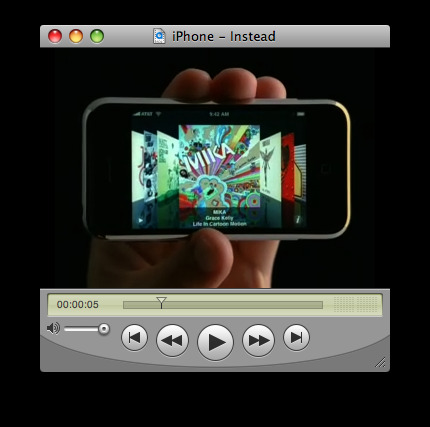 Check out todays Daily iLife video, entitled Instead, which is apart of the original iPhone ad campaign. Watch it here and remember, if you would like a video everyday- subscribe in your favorite reader or iTunes. 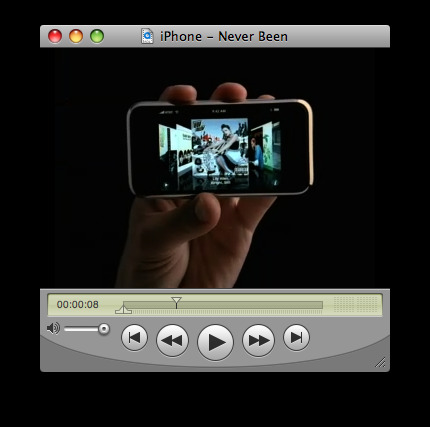 Check out todays Daily iLife video, one of the original ad’s for the iPhone entitled “Never Been”. If you enjoy videos from the Daily iLife, remember to subscribe in iTunes, or your favorite reader. Continually, year over year, Apple has been selling more Macs. This year has been no exception- the Mac market share continues to grow. This years surge might have seen more sales thanks to Vista or, release of Leopard. Either way, there is some kind of ‘iPod Halo’ effect going on. Be it the iPod, Leopard or iPhone- Apple is getting their name out and, people are moving to the Mac. It is interesting to watch a new generation of switchers come to the platform after using a Mac for the entirety of my computing life. Many new switchers seem to be mesmerized by Photo Booth or iChat video conferencing- which my cousin and I laugh at, we were doing this almost 5 years ago! The new switchers seem to neglect some of the founding principles of the Mac platform because, face it- they’ve been using Windows. While other PC users rejoice that they no longer have to run Anti-Virus or Spyware programs anymore on their Mac, which is something that I still do not do on my PC or Macs (yes, I own 4 PCs). The change of Mac users from the generally more computer literate to the less literate will be interesting. The iPod is simple, powerful and, successful. Although the Mac is built around the same concept, it is a computer. I have found, working with other people who aren’t very computer literate that they prefer a static setup- be it Windows or Mac OS. They want everything to look the same, nothing to change- all they want to do is check their email (or whatever it is). So you can (or can’t) imagine how a switch to a Mac from a PC can become traumatic for those accustomed to Windows- they just want to go back. The same can be said about the switch from VHS to DVD- other than video geeks, it takes a couple years for ‘the masses’ to make the switch. The switch usually comes with a hardware replacement. For example, our VHS player stopped working so we bought a DVD/VHS combo about 6 years ago. When that dies, we will probably just get another DVD player- especially considering the status of the new formats. So, Vista is what is brining PC users to the Mac OS- their XP machine needs replacement, and fearing Vista (or after experiencing it), they get a Mac. Keep tuned for Part III. We are sorry for the lack of content over the past few days. I for one have be en-route to New Jersey all day today and was celebrating Christmas with family over the past few days. However, I have been working on a video podcast as well as some articles which you should see coming very soon. We’ll be back in full swing tomorrow, we promise! For all of you who are celebrating today, Merry Christmas! What have you received? Something good and shiny, lets hope (MacBook? iMac?)! 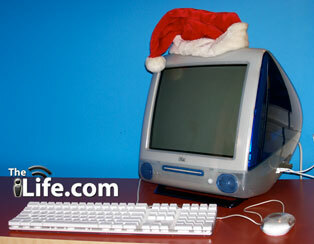 Check out todays Daily iLife podcast video, and be grateful you didn’t get one of those gifts! With Christmas right around the corner, all shopping should be done at this point. So, what are you giving this holiday season? What are you getting?? Hopefully something with a shiny Apple on it!! If you are giving a new computer, just don’t let it end up like this. Just get a Mac! And if you don’t know what you’re getting, you can always track Santa here. From all of us at theiLife.com, we wish you and your families the best for Christmas, New Years- or whatever you celebrate! Content around here might be a little scarce over the next week (we like to vacation too) but, rest assured that in the New Year we will be back in full force and with Macworld fast approaching! Of course, in the meantime you can always entertain yourself with daily updates to The Daily iLife or the Macworld Countdown Widget. For all of those counting down the days until Christmas or New Years, we are counting down until Macworld. So for all those waiting on those new MacBooks or iTunes Rentals, or whatever Sir Steve throws at us- may the counting begin! Get yours at our new Downloads page. For those of us who are counting down every last second until the 3G iPhone launch! Download in both White (332KB) and Black (332KB) versions. For those awaiting every second until Macworld 2008, we have released a widget that counts down those precious days, hours, minutes and seconds. Don’t worry, we are too.